Sci Transl Med 2014 6(250), 250ra112. Carfilzomib (PR-171) purchased from Selleck. Immunoblot analysis of EZH2 in MM.1S cells treated with the indicated doses of carfilzomib for 24 hours. GAPDH served as a loading control. Clin Cancer Res, 2017, 23(16):4817-4830. Carfilzomib (PR-171) purchased from Selleck. MM.1S cells were treated with or without carfilzomib (10 nM) in the presence or absence of TAS-117 (0.5 uM) for 24 h. Whole cell lysates were subjected to western blotting using CHOP, PARP, and GAPDH Abs.The graph represents fold changes of CHOP density relative to GAPDH. Cancer Res 2014 74(16), 4458-69. Carfilzomib (PR-171) purchased from Selleck. Transduction at 24 h is indicated as normalized luciferase activity. HeLa cells were cotreated with 1 uM Carfilzomib and 500 vg/cell rAAV2-EGFP, and transduction was analyzed by ﬂow cytometry at 24 h. Bright-ﬁeld and EGPF ﬂuorescence images at 24 h postransduction of cells visually indicating transduction. J Virol 2013 87(23), 13035-41. Carfilzomib (PR-171) purchased from Selleck. ANBL-6 cells (2 × 106/well) are plated in 96-well plates and treated with Carfilzomib doses from 0.001 to 10 μM for 1 hour. Cells are then lysed (20 mM Tris-HCl, 0.5 mM EDTA), and cleared lysates are transferred to polymerase chain reaction (PCR) plates. A standard curve is generated using untreated ANBL-6 cell lysates starting at a concentration of 6 μg protein/μL. The active site probe [biotin-(CH2)4-Leu-Leu-Leu-epoxyketone; 20 μM] is added and incubated at room temperature for 1 hour. Cell lysates are then denatured by adding 1% sodium dodecyl sulfate (SDS) and heating to 100°C, followed by mixing with 20 μL per well streptavidin-sepharose high-performance beads in a 96-well multiscreen DV plate and incubated for 1 hour. These beads are then washed with enzyme-linked immunosorbent assay (ELISA) buffer (PBS, 1% bovine serum albumin, and 0.1% Tween-20), and incubated overnight at 4°C on a plate shaker with antibodies to proteasome subunits. Antibodies used included mouse monoclonal anti-β1, anti-β2, anti-β1i, and anti-β5i, goat polyclonal anti-β2i, and rabbit polyclonal anti-β5 (affinity-purified antiserum against KLH-CWIRVSSDNVADLHDKYS peptide). The beads are washed and incubated for 2 hours with horseradish peroxidase-conjugated secondary goat antirabbit, goat antimouse or rabbit antigoat antibodies. After washing, the beads are developed using the supersignal ELISA picochemiluminescence substrate. Luminescent detection is performed. Raw luminescence is converted to μg/mL by comparison with the standard curve and expressed as the % inhibition relative to vehicle control. Curve fits are generated using the following nonsigmoidal dose-response equation: Y = Bottom + (Top-Bottom)/(1 + 10̂((LogEC50 − X) × HillSlope)), where X is the logarithm of concentration, Y is the % inhibition, and EC50 is the dose showing 50% effect. Method: WST-1 is used to determine the effects of proteasome inhibitor Carfilzomib on cell proliferation. The inhibition of proliferation is calculated in relation to parallel control cells that receives vehicle alone. A linear spline function is used to interpolate the median inhibitory concentration (IC50) using XLfit 4 software. The degree of resistance (DOR) is calculated using the formula: DOR = IC50(resistant cells)/IC50(sensitive cells). ANBL-6 cells pulsed with 100 nM carfilzomib are washed and suspended in PBS containing 5 μg/mL of JC-1, which exhibits potential-dependent accumulation in mitochondria. Analysis of the mitochondrial membrane potential-dependent color shift from 525 to 590 nm is carried out on a FacScan, and the data are analyzed with CellQuest software. Kuhn DJ, et al. Blood. 2007, 110(9), 3281-3290. Kuhn DJ, et al. Curr Cancer Drug Targets. 2011, 11(3), 285-295. Hurchla MA, et al. Leukemia. 2012. Dasmahapatra G, et al. Mol Cancer Ther. 2011, 10(9), 1686-1697. How should I prepare solution of Carfilzomib for ongoing in vivo study? This compound can be dissolved in 2% DMSO/30% PEG 300/dd H2O at 10 mg/ml as a suspension, and can be dissolved in 2% DMSO/ castor oil at 10 mg/ml as a clear solution. Ixazomib (MLN2238) : β5 site, IC50=3.4 nM; β1 site, IC50=31 nM; β2 site, IC50=3500 nM. 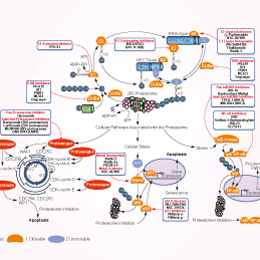 Bortezomib (PS-341) : 20S proteasome, Ki of 0.6 nM. 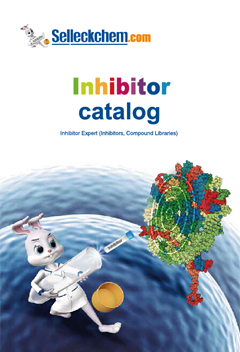 Oprozomib (ONX 0912) : Orally bioavailable inhibitor for CT-L activity of 20S proteasome β5/LMP7 with IC50 of 36 nM/82 nM. Features:A first-in-class proteasome inhibitor that has improved pharmacokinetics (PK), pharmacodynamics(PD), and antitumor activity in preclinical studies. Features:The 1st oral proteasome inhibitor in early stage clinical trials for Multiple Myeloma. Features:A potent antioxidant and anti-inflammatory drug.